Ok, here's the ultrasound. So it's just the face. You can see the eyes, nose and mouth, and the cheeks look kind of squished. I was going to put arrows and callouts on the picture to help you figure it out, but, nah, too lazy. I think it's pretty clear. Is that just me? What do you think? heehee, kinda reminds me of a kid pushing their face up against a window. Hi Mom! Anyone that has seen an ultrasound before will have no problem seeing it. It astounds me how far they have come just in the 10 years since we were looking at Kira in one! Great picture. Oh, that picture is beautiful!!! I can't wait to hold the little one. I am so sorry...I can't even tell which way up this photo is supposed to go. I must be ultrasound-interpretation-impaired, given the other comments above mine. 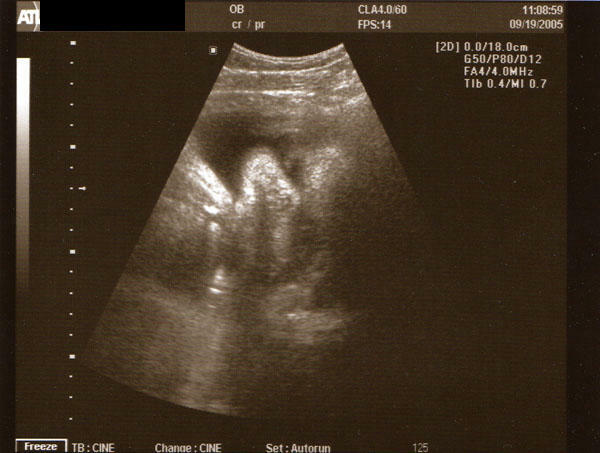 Maybe it's because I never had an ultrasound with my first baby (and only two with our second). Oh well. I'll have to wait to see a photo of the baby OUTSIDE. I'll be patient.